Stop-motion animation house Aardman’s Early Man project was packaged by StudioCanal, which at the time was releasing the modestly successful Aardman picture Shaun the Sheep Movie. 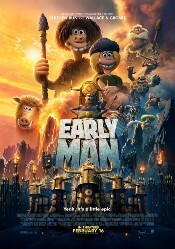 StudioCanal majority financed Early Man for $50 million and the British Film Institute (BFI) awarded the production £2,000,000. Canal brought the project to Cannes in 2015 for pre-sales and it quickly sold out in almost every market. StudioCanal handled distribution duties in the UK, France, Germany, Australia, and New Zealand. At Cannes in 2017 Lionsgate acquired US rights, after the mini-major had partnered with both Aardman and Canal on Shaun the Sheep. StudioCanal dated Early Man in the UK for January 26, 2018 which was Aardman’s home and strongest market. Shaun the Sheep Movie had posted the company’s lowest UK gross with $21.9 million and Early Man disappointed with $15.8 million. Lionsgate scheduled the US release for February 16 and invested in an expensive marketing campaign, spending $15.84 million on TV ads (as per iSpotTV) and millions more on other traditional advertising and distribution expenses. The stateside P&A costs were in the usual $30M+ range. Even with the marketing exposure, Early Man was tracking for a terrible $5 million opening and had the misfortune of being released in the shadow of Black Panther. Also impacting Early Man‘s box office was a crowded family marketplace with Peter Rabbit released the week prior and Jumanji: Welcome to the Jungle still going strong in its 9th frame. Reviews were positive, but Early Man was dead on arrival with $3,190,525 — placing #7 for the weekend led by Black Panther. Showing weak legs, it declined 44.4% to $1,773,963 the following weekend and then sank 72.6% to $486,262 in its third session. The US run closed with just $8,267,544. Lionsgate would see returned about $4.5M after theaters take their percentage of the gross. The overseas numbers stalled at a very troubling $46.3 million across numerous distributors — leaving Early Man as Aardman’s lowest grossing feature. I’m going to be honest, I actually really did want to see this film(especially since I really did love “Shaun the Sheep Movie”(which is also from Aardman)), but I may have been a bit too overwhelmed(since it was coming out the same DAY as “Black Panther”, a film I was REALLY hyped for), and forgot about the film(that may have been due to the POOR marketing this film had) as a result. I’m really disappointed that this film flopped HARD at the box office, especially in the USA. Shame. It deserved to do better. One thing that killed it in the US is that the entire film’s about soccer. They tried to cover it up in some of the marketing, but it didn’t work.